What better way to say I Love you then with flowers! The students of Assumption Catholic School were choosing their flowers for their Mother's. 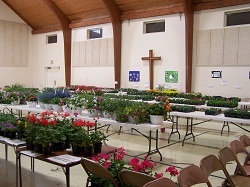 The Garden Club was sponsoring the sale to raise money for weed barrier and the possibility of purchasing a rotor-tiller so they can turn over the soil each spring. Students in the Eighth grade class made the pots look pretty for their customers as they eager made their choices of geraniums or chrysanthemums. Meanwhile, seedlings were growing in the Pre-k room. Beans, tomatoes, and cucumbers were growing in a green house or hydro-phonic station with the help of three goldfish. We are growing more than just minds over her at Assumption Catholic.